Don’t let Old Man Winter get you down. With the right light, your home can feel bright and cheery, even when it’s gloomy outside. During this time of year, the shorter, darker days make many people feel a bit melancholy. Seasonal Affective Disorder (SAD) can cause depression-like symptoms. However, there are some things homeowners can do to counteract the effects of SAD. If your home does not have a lot of natural daylight, following are some tips for making rooms brighter and more cheerful. Maximize any available morning daylight. 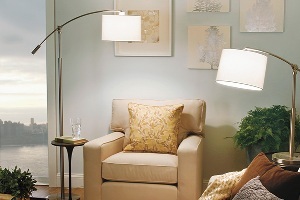 Use light colors for room surfaces. Use highly reflective white paint for the ceiling. Incorporate an indirect light source into your room. Use accent and spot lights – perhaps from track or cable lighting – to add bright accents on plants, decorations or feature areas. The effect will be similar to sunshine and shadows. To find the right lighting products for your home, visit Hortons Home Lighting. When it’s cold outside, a warm cozy home is all the more inviting. One of the most dramatic improvements you can make for the very small cost and effort involved, is the addition of dimmers. Using a dimmer makes it easy to create the perfect ambiance for indoor activities. In a room where a central lighting fixture dominates the space, dimming allows that fixture to provide a more subtle and comfortable light and lets other fixtures provide appropriate contrast. The addition of one or two portable light fixtures will also help set the perfect stage, especially if they are connected to a table-top dimmer, which can be found at all Hortons locations. A Hortons trained lighting professional can help create the perfect ambiance for your home. Are 40- and 60-watt candelabra-based bulbs going away? No, the candelabra bulbs are not being phased out, however, they must not exceed 60 watts. What type of light fixture is best to illuminate two side-by-side 5′ x 3′ wall pictures? Currently, there are overhead can lights that aim straight down. Adjustable recessed can lights are available that can be aimed toward the pictures. Depending on the location and diameter of the opening of the existing fixtures, it is possible that those recessed can lights could be replaced with the adjustable type. It would be a good idea to take a diagram, showing the exact location of the fixtures and pictures, to a Hortons Home Lighting professional advice about your specific situation.